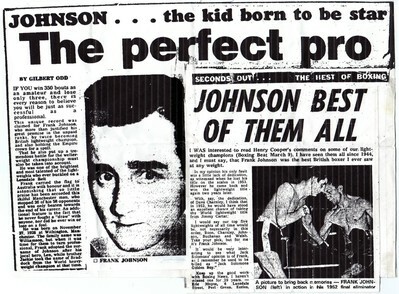 Johnson was… the kid born to be a star…The perfect Pro.. We remember Frank Johnson. If you have 365 bouts as an amateur and lose only three, there is every reason to believe that you will be just as successful as a professional. 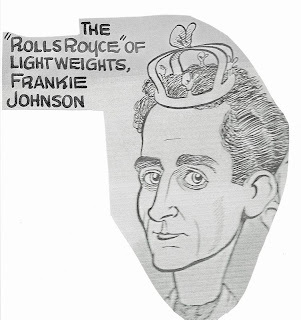 This unique record was claimed for Frank Johnson who more than justified his great promise in the unpaid ranks by turning professional and twice becoming British Lightweight Champion and also holding the British Empire Crown in 1953. He was never quite granted the opportunity of A World Title fight but at his peak in 1952-1953 he would have stood an excellent chance of taking the World Lightweight Championship. The fact that he also put up a tremendous battle for the welterweight championship must also be taken into account. He was one of the brightest and most talented of the Lightweights who ever buckled on a Lonsdale Belt. 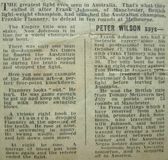 Frank carried the flag to Australia with honour when he won the British Empire Lightweight Title in 1953 in what was described as… “…the greatest fight ever seen in Australia – that’s what they called it after Frank Johnson, of Manchester, British Lightweight Champion, had smashed the Australian Champion, Frankie Flannery, to defeat at Melbourne” (Peter Wilson/ The Daily Mirror). It is astonishing that so little praise has been accorded this skillful Manchester man who stopped 26 of his 58 professional opponents and was only beaten towards the end of his career. “What a great and classical contest this was. It had the crowd tingling with excitement from start to finish” (Tom Phillips/ The Herald). He was born on November 27th 1928 at Withington, Manchester. The family name was Williamson, but when it was time for him to turn professional, Frank adopted the name of Johnson after his local hero Len. His brother Jackie, who was ABA Lightweight Champion in 1945, took the name of Braddock from the World heavyweight champion at that time. Johnson turned professional at the age of 17 but signed up for a London manager and had done most of his fighting in the south. However, in 1952 Manchester finally awakened to the fact they had a champion to be. Frank became the first Englishman to travel all the way to Australia to challenge for the Empire Lightweight Title. 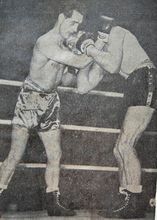 He was matched with the rugged Australian Champion Frankie Flannery who was a hot favourite to win the title but Johnson produced a masterful display of box-fighting to completely upset the odds and take the Empire Crown in what experts described as…“…the fight of the century” (The Mercury/ Hobart, Tas). “JOHNSON’S VICIOUS PUNCHING SHOCKS STADIUM CROWD – Frank Johnson of England, staggered spectators when he produced some of the most vicious and sustained punching ever shown by a Lightweight in his win at the stadium last night” (Jack Dunn/ The Sun News, Melbourne, Australia). “SHOCK BLOWS WON TITLE – Two lightning punches from Frankie Johnson (England) a few seconds before the end of the second round put Frankie Flannery on the road to defeat in their battle for the British Empire Lightweight Title at Melbourne Stadium last night. These two HIGH VOLTAGE BLOWS shocked not only Flannery but most of the huge crowd. The nuggety Australian Champion was slightly shading Johnson in the second round when the Englishman cut loose with top speed punching for the first time – he drove home a left hook and short right with almost eye-baffling speed, both clean to the jaw” (Steve Hayward / Melbourne Sports Journalist, Australia). 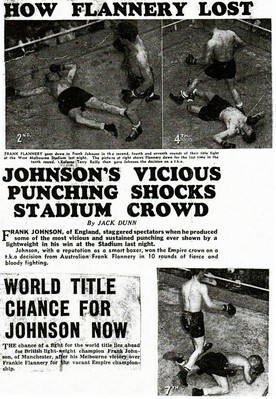 The chance of a fight for the World Title lay ahead for Frank Johnson after his Melbourne victory over Frankie Flannery for the Empire Championship. However, Johnson soon found life at the top also brought its problems. It was rumoured that Johnson was having problems with his manager and often he considered the wages he was offered to be inadequate. At times he failed to make the agreed weight and he caused a sensational shock when, in the first mandatory defence of his British Lightweight Title, he turned up several hours late for the weigh-in, then subsequently failed to satisfy the scales! 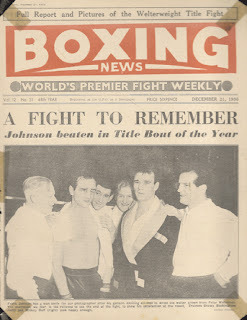 Johnson was immediately stripped of his titles and coveted Lonsdale Belt – the fight later had to go ahead as a non-title bout over twelve rounds – Johnson boxed like he was completely dis-interested in the outcome of the contest and was subsequently outpointed by Joe Lucy of London. (Special Correspondent/ UK News ). “What has happened to Johnson? Ford takes Empire Crown in tame fight” (Harold Balfe/ The Argus, Melbourne). The rumours were rife of management troubles and weight making problems. After another trip to Australia without success, the natural step was to move up into the Welterweight division but Johnson took a good break from the ring to think over his future. Most people thought that this was the last they would see of Johnson. Frankie decided to make his return to the ring and he trained hard to make the Lightweight limit again. 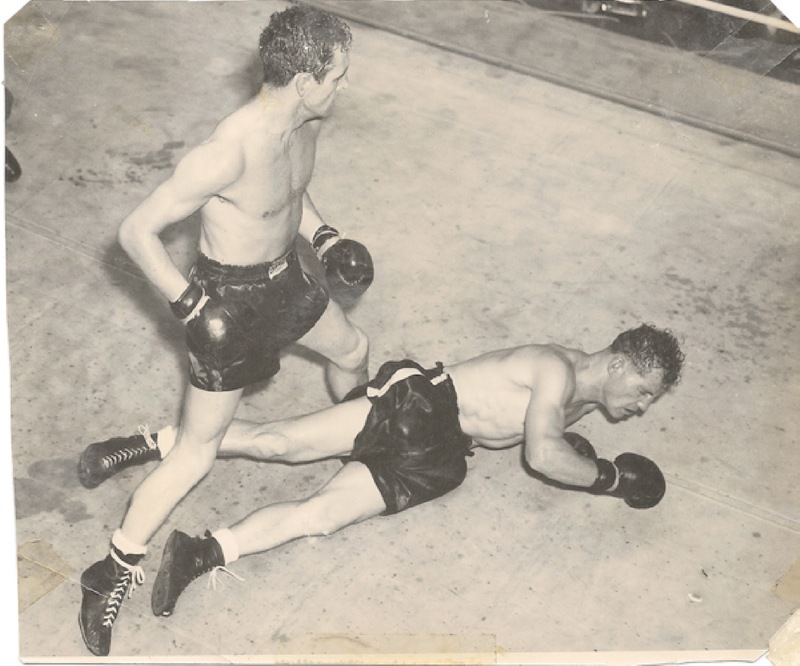 Then in 1955 was granted a second chance against Joe Lucy for the British Lightweight Title. This fight was at Harringay Arena and was the first fight to be broadcast live by the BBC – millions watched a masterful display by Johnson to regain the Lightweight Title in a hard fought, close fight over fifteen rounds. (Frank Nicklin/ Sport Talking Point Of The Day, Evening Telegraph). (Champs I Have Known by John Kay, Manchester Evening News Pink). Johnson trained hard enough and had to go without a real meal for 48 hours before the weigh-in. He made the eight… but only just and was obviously ill-equipped to make a long fight of it. Lucy and his handlers had seen the signs and planned accordingly. Without hesitation Lucy ran away from the Champion in the early rounds. Johnson frequently forsook his superior boxing ability in an attempt to end it quickly. He failed – the weight making ordeal had severely weakened him and by the eighth round Lucy was ready to make his move. He went for the body and then the head and Johnson was stopped with a badly cut right eye. It was Johnson’s last defeat as a Lightweight and once again, people thought that was the last they would see of Frank. “Manchester’s Lightweight Champion has proved the enigma to end all enigmas!” (Harold Mayes/Northampton Chronicle & Echo). Three months later Frank decided to try his luck in the heavier Welterweight division and he teamed up with Jack Bates, an old fighter and master trainer who had been prominent as corner man to King, Brown and McAvoy. Johnson was much more comfortable and stronger in the Welterweight division. 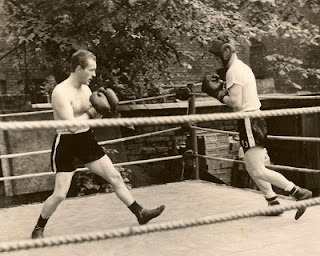 Bates and Johnson mapped out a campaign aimed at the British Welterweight Title held by Peter Waterman. 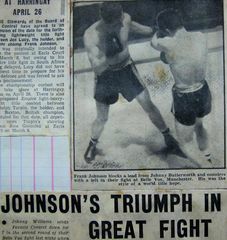 “JOHNSON REALLY MEANS BUSINESS – Brilliant… classy… scorching… String together those three adjectives and you have some idea of the performance former British Lightweight Champion, Frank Johnson turned in when stopping Albert Carroll (Bethnal Green) inside three rounds” – (Boxing News/ UK Weekly). He had earned his chance to be Champion again and he was granted the opportunity against the British Welterweight Champion, Peter Waterman on December 17th 1956. Few gave Johnson a chance at this later stage of his career,against the flailing fists of Waterman, who was six inches taller and six years younger than Johnson. The odds could never have been heavier against a challenger – Peter Waterman was the younger, big-punching champion who had only ever lost one fight, to the legendary World Welterweight Champion, Kid Gavilan. Johnson had his own ideas and was sensationally defying all the odds before an unfortunate clash of heads, (which caused his left eye to close completely) brought the inevitable end in the tenth round. But for those ten rounds, Johnson taunted and harassed the champion with a quick-silver left and a short punishing right-hook. 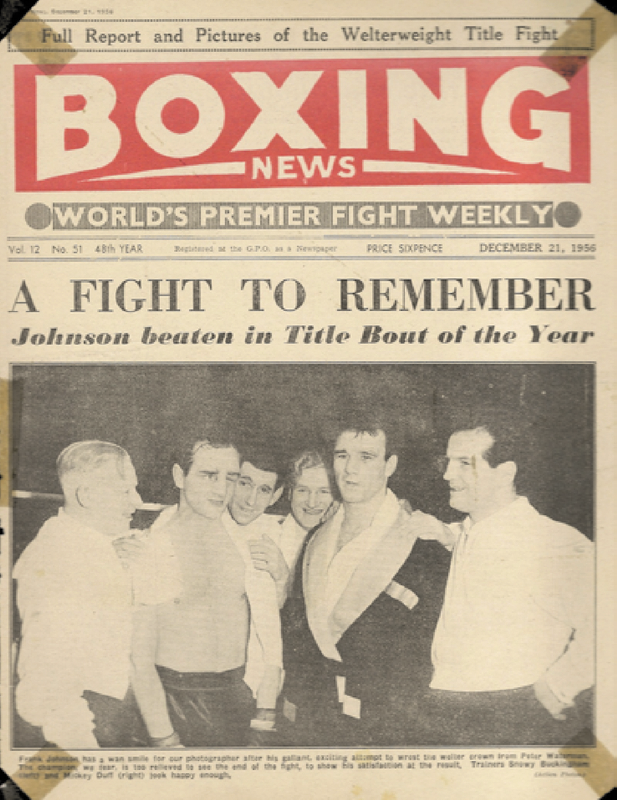 (Boxing News/ UK Weekly, Dec. 21st 1956). It was one of Johnson’s greatest performances but also it was the end for a boxer granted few favours in the toughest sport. This was one of the greatest fights seen between welterweights for many years, and Johnson, who was a complete outsider in the betting, covered himself with glory and was, in my opinion, in front on points at the end of the fight. In the first round it appeared that public opinion of Waterman’s chances were fully justified. He appeared the stronger boxer, and the more aggressive fighter. Also, as early as the first minute, Johnson’s left eye was slightly cut. 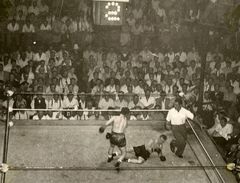 However, midway through the second round, it became obvious to students of boxing, that Johnson was taking most of Waterman’s punches on the arms and shoulders, and tying him up in the clinches. However it was in the fourth round that the excitement really reached its peak. Johnson, who had been hooking Waterman to the body, suddenly changed his direction, and caught the champion with a perfect right hand on the chin, and as he fell forward, smashed a left hook underneath his heart. Waterman went down for nine, and although he just managed to beat the count, he took a beating from Johnson, and it was seen that his right eye was bleeding when he went back to his corner. Johnson was again on top in the fifth round, hooking Waterman to the stomach. In the sixth round the action was repeated and, on this occasion, the champion’s left eye was slightly cut. However, Johnson had not escaped unscathed, and the champion, who staged a terrific rally in the seventh and eight rounds, evened up the points. The most significant thing at this stage of the fight was that Johnson’s eye trouble was blinding him and his punches were out of distance. However, he won the ninth, and broke even in the tenth… but it was obvious by now that his enormously swollen left eye was a really dangerous handicap, and his trainer was well advised to surrender for him. There are however, a couple of things that are not in this story. One is my visit to the dressing room after the fight. Johnson was sitting on the rubbing table, and his trainer and new manager Jack Bates, was holding an ice pack to his eye, which was cut in three places and swollen to enormous proportions till it resembled nothing so much as a huge burst mulberry. There was also an ugly gash on the bridge of his nose. Indeed my friend looked in a sorry state. However, that whimsical smile was there and the first thing he said was, “…Did you enjoy the fight Terry? – “I’m sorry I let you down. I was going all-right when this happened. I’d like to meet Waterman again as soon as possible… I said how sorry I was he’d lost, and he astonished me by saying..
“I don’t mind losing you know? As long as I feel that I put up a good show. I never have minded taking a beating… That, I maintain, is a very complete philosophy” (Terry Leigh-Lye/ Irish Times). 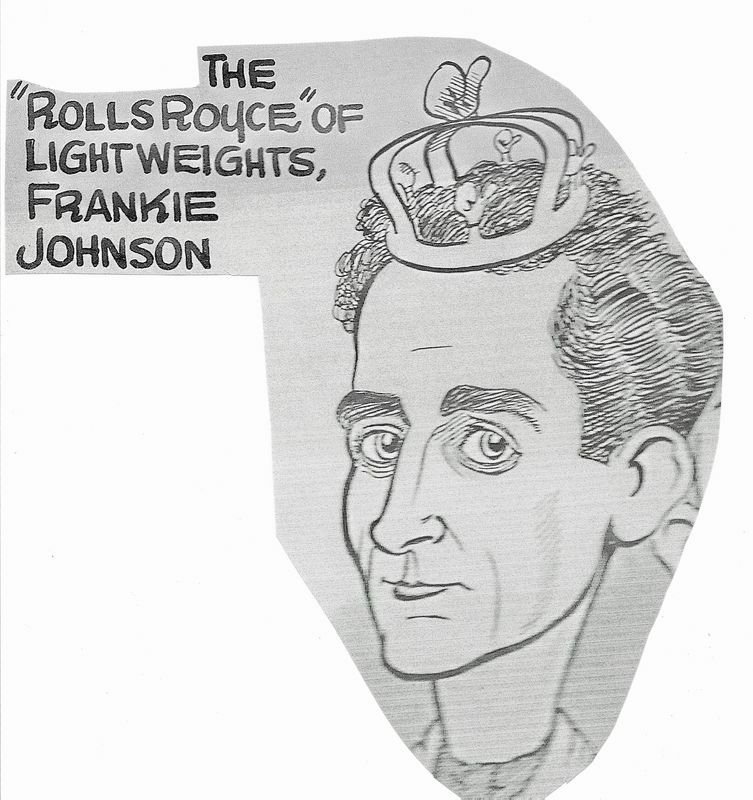 Frank Johnson was champion in a boxing era that was completely different from today’s. He fought in the times when there were only eight true weights with just one governing body. Just before and after the Second World War, there were three to four thousand boxers registered with the British Boxing Board Of Control, and almost a thousand Lightweights in that single division. Today, there are only a few hundred boxers in all the weights added together. 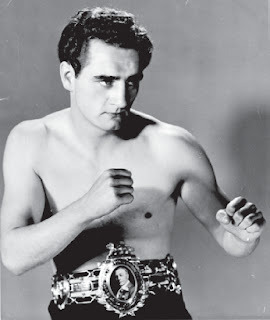 Frank Johnson was the only Manchester boxer to win the British Title and Lonsdale Belt in a period of nearly forty years. Today, Frank Johnson would have undoubtedly been a multiple weight world champion. “What a great and classical contest this was. It had the crowd tingling with excitement from start to finish. 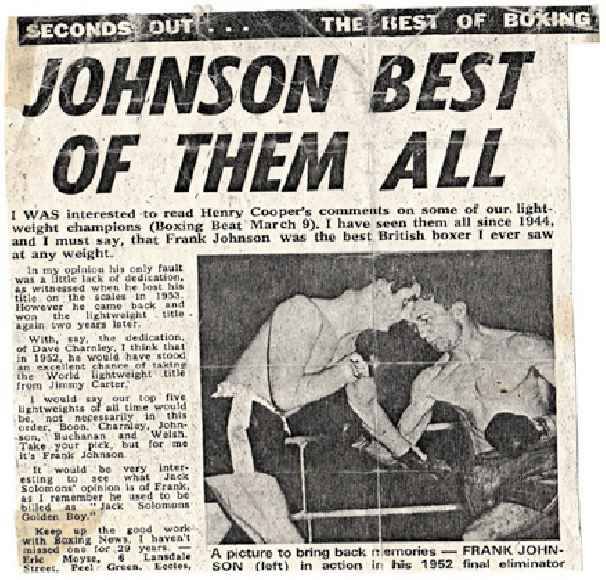 Johnson was the cool, stylish, classical boxer, the master of footwork, of stance, of evasive action and of counterpunching” (Boxing News/ UK Weekly). There is no question that untold harm has been done to modern British boxing: Promotional alliances formed with the TV companies like Sky and the subsequent proliferation of ratings-driven “phoney” world championships contested by fighters who would once have been fortunate to pick up small change for appearing on under-cards have diluted the sport. No wonder that boxing now only gets fringe status in British newspapers. One thing about the sweet science upon which all initiates are in agreement is that it used to be much better. In the 1950’s every British national print newspaper employed a full time boxing correspondent. Frank Johnson was a master craftsman in a bygone golden era. Weight was his biggest enemy – not ring opponents. He often struggled to make the poundage required and occasionally left himself “weak at the weight” The modern day boxing game with it’s multiple weights would have suited Johnson perfectly. It was generally accepted that a “fit and strong at the weight” Johnson could have beaten any fighter in the World. He was certainly one of boxing’s most polished performers. “British Boxing at it’s very best” (Weekly Sporting Review, August 2nd. 1952). Commencing his career in 1946, Frank had over four hundred contests (not including his hundreds of boxing booth contests) and beat such outstanding fighters during his career as… Kid Tanner, Ellis Ask, Frank Flannery, Alby Tissong, Joe Lucy, Tommy McGovern, Johnny Butterworth, Tommy Bailey, Tommy Barnham… and the legendary Frenchman Guy Gracia, who was the scourge of almost all the leading Lightweights in the fifties, beating Dave Charnley (twice), Sammy McCarthy, Billy Kelly, Joe Lucy, Tommy McGovern etc. Frank died tragically on June 7th 1970 but left behind the memory of a great Champion with lightning speed and lethal finishing, yet one who preferred brains to brawn – he was also a gentleman in and out of the ring. 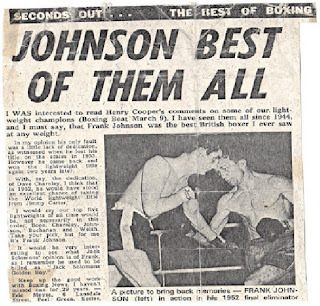 “Johnson is where he is today because of his brilliant ring craft – his command of the ring and his tactics are an object lesson to all who see more in the game than wild blasting”(Jimmy Wilde, Ex World Flyweight Champion). Really interesting and well put together, quality of material on the site is excellent and informative.